Have you heard the news? MAKE UP FOR EVER is now available at Escentual and I’m pretty excited about it! Known for their innovative formulas and textures, MAKE UP FOR EVER is a brand you need to know about! 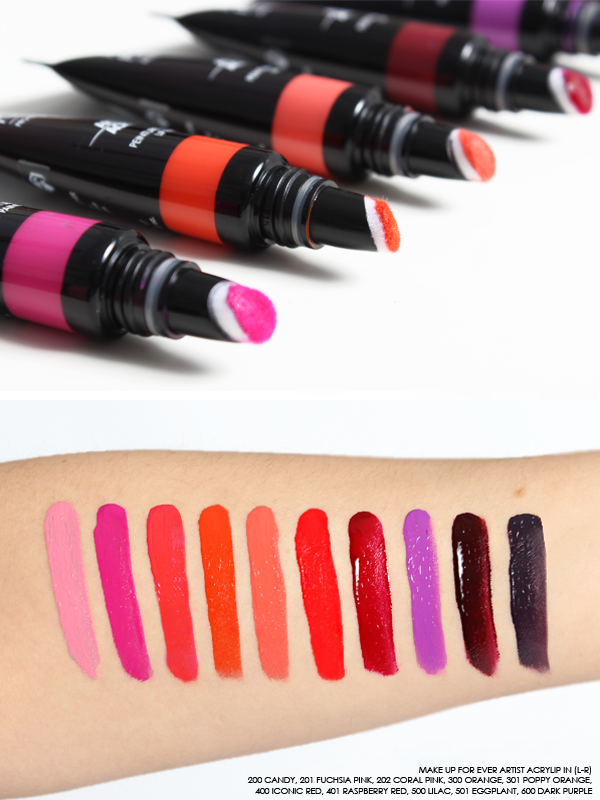 One product, in particular, that’s got everyone talking is the Artist Acrylip; high-pigment lip paints that cocoon the lips in comfort and colour in a single stroke. 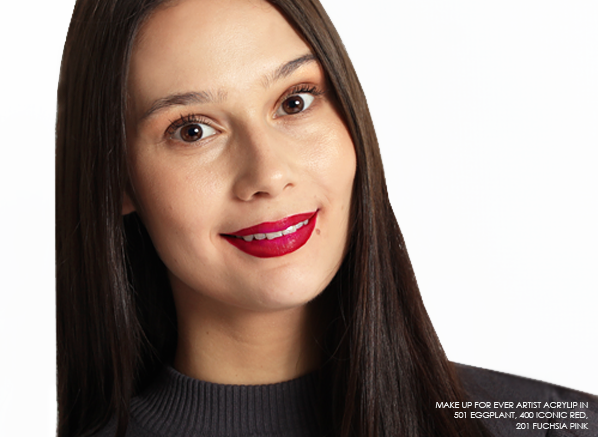 Fronted by international singer, Jessie J, the Artist Acrylips are non-sticky and offer great versatility, allowing you to achieve everything from a lip stain effect to full coverage. • Vegetal Ricin Oil – 50% of the Artist Acrylip formula, vegetal ricin oil nourishes and comforts the lips, as well as acts as a colour booster. • Mineral Clay – The ingredient behind the smooth and consistent texture, mineral clays guarantee an easy-glide formula. • Silica Gel – Lips will look super smooth thanks to added silica gel as they work to fill lines with a 3D matrix gel, as well as absorb any excess oil. • Castor Oil – The wetting properties of castor oil help to optimise pigments for deeper colour. • Synthetic Mica Particles – The Artist Acrylip’s have beautiful luminosity thanks to reflective synthetic mica particles. I couldn’t wait to put the MAKE UP FOR EVER Artist Acrylips’ to the test! Inspired by Jessie J’s ombre-effect look as seen in the adverts, I decided to try it out myself. So here’s my more wearable interpretation of her look – a deep red lip with a pop of pink in the centre! To begin, line the lips with the MAKE UP FOR EVER Artist Acrylip in 501, a deep purple shade that acts as the first phase in this ombre-effect look. Use the MAKE UP FOR EVER Lip Brush 304 to trace the lip line, this precise brush will allow you to get an even and tidy finish. Next, apply the MAKE UP FOR EVER Artist Acrylip in 400, a true red shade that will contrast beautifully with the purple hue of 501. 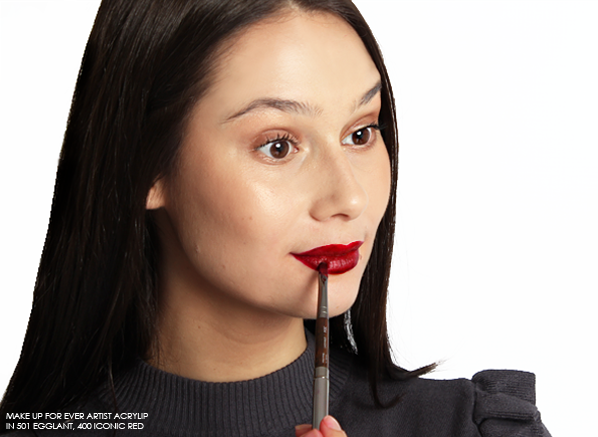 Apply with the same MAKE UP FOR EVER Lip Brush 304 to the inner part of the lips, applying with a brush will help you to have better control and an easier blend. To complete this step, blend the edges of both colours seamlessly into one and other. Last but certainly not least apply the MAKE UP FOR EVER Artist Acrylip in 201 to the centre of the lips. This will enhance the ombre-effect already created while creating a fuller effect. This entry was posted on Thursday, May 25th, 2017 at 2:54 pm and is filed under Get the Look, Make-up, New products, Spotlight On, Swatches. You can follow any responses to this entry through the RSS 2.0 feed. You can skip to the end and leave a response. Pinging is currently not allowed.